If we hadn't told you this was a shipping container house, would you have known?? 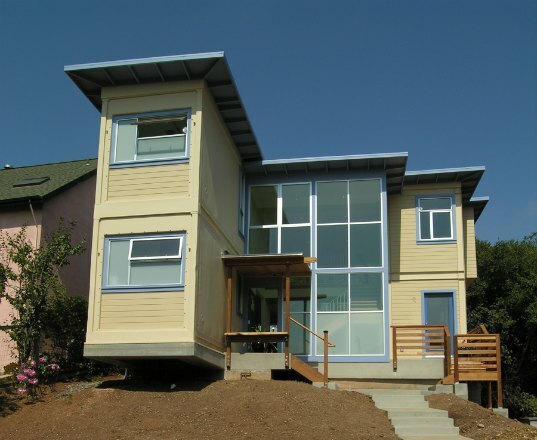 With a contemporary classic style, regular-looking facade and huge light-filled windows, this lovely home in Richmond, California, designed by Leger Wanaselja Architects, is a great example of the beautiful work that can done with shipping containers. You may like the industrial look of the container, but if you're into a more traditional look, this is the house for you! Check out the interior shots of this deceiving home - they give you a really good idea of the available space. Built out of three insulated shipping containers and stacked on two levels with a two-story atrium in the middle, this home packs a lot into a small footprint. Coming in at only 1,350 sq feet, the home has three good sized bedrooms, and a large open living room which connects into the long kitchen and dining room. Two 40′ containers are stacked on top of each other serving as the master bedroom on top and a kitchen/dining area on the ground floor. The other container is cut in half and stacked to create two more bedrooms. Between the stacks is a large two story living area with floor to ceiling windows and a staircase and bridge to connect to the rooms upstairs. Solar passively designed, deep roof eaves were used to protect from summer solar gain and operable windows were used to maximize ventilation. As the containers are already insulated, they act as weatherproof exterior siding, insulation, and structural frame. Insulation was only needed in the roof and flooring and framing was only done on interior walls and for the windows. Additional green features include the use of low VOC paints, a 100% wool carpet, bamboo flooring, a 50% flyash concrete foundation, blown-in cellulose insulation, stacked plumbing, roof rainwater collection, high efficiency lighting, solatubes, and a ton more green features which you can see here. If you are considering a modular or prefab home, building with containers is worth taking a look at. Good resource is the the Residential Shipping Container Primer website. A SHOWCASE OF SHIPPING CONTAINER HOMES AND BUILDINGDS, AND A DO IT YOURSELF (DIY) REFERENCE FOR CONVERTING RECYCLED INTERMODAL CARGO SHIPPING CONTAINERS INTO BUILDINGS AND ARCHITECTURE. http://www.ResidentialShippingContainerPrimer.com Lots of great example buildings, details, facts, and links to other articles. They have something new that you can setup your own project wiki to get help with your project if you are considering a design build project. If you're interested in building with ISBUs, then you might want to check out our new book: Intro to Container Homes and Buildings. http://tinyurl.com/2c76y5b It's almost 100 pages of tips for building with ISBU, and 20 houseplans (with build budgets). This is pretty cool. Seeing this was 'put together' in California, how would it fare in the midwest? What about total cost of this particular home? The beautiful home certainly doesn't look like a container house from the exterior and the arrangement of the large windows makes the home seem really inviting. The home was built back in 2007 and was very well documented. The construction photos really show the evolution of the design and how the containers were used to build this dream home. Three 40' insulated containers were used to build the home - two were stacked on top of each other and the third was cut in half. The containers are separated by a large atrium with floor to ceiling windows. The insulated containers provide weatherproof exterior siding, insulation, and a structural frame and they require little else except exterior siding to finish them off. 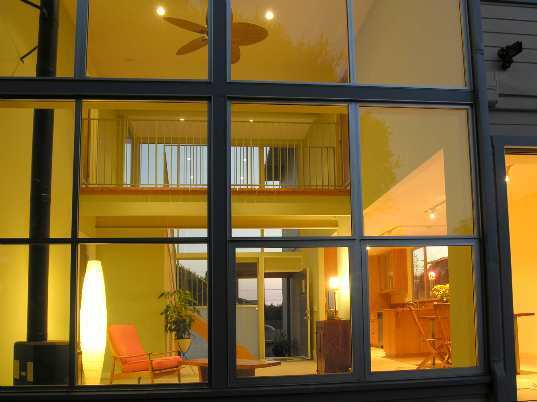 The large atrium serves as a living room and central breezeway. A staircase and bridge connect the 2nd floor rooms together. The galley kitchen and dining room take up the bottom floor of the longer containers. Thekitchen and dining room open up into the light filled living room. The home was designed solar passively and large eaves protect the interior from summer solar gain, but provide warmth during the winter. The master bedroom is a light filled space with plenty of room even inside an 8 foot wide container. One of the bedrooms, which also has lots of windows, makes excellent use of the space. Containers were lifted into place using a crane. This shows the arrangement of the three containers - two long ones, and one cut in half on the right. Construction of the home after the containers have been placed. Construction of the central atrium and roof eaves.